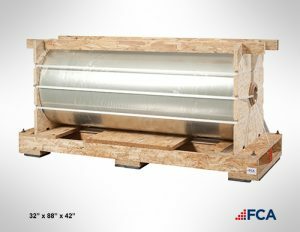 FCA Packaging provides custom industrial packaging solutions for companies looking to ship or store their products safely and economically. Industrial packaging is not a one size fits all for businesses. It might seem cheaper to buy ready made products, yet if something goes wrong, not only is your product damaged, but potentially your reputation. We offer an alternative that is economical and secure. 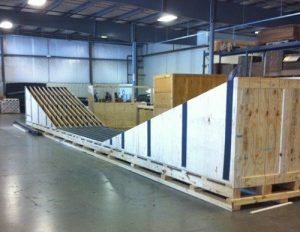 From custom built skids to crates built to the unique configuration and weight of your product, we offer manufacturers a number of customized options ranging from reusable products to products designed for high volume production runs. Our engineers design solutions designed specifically for your products ranging from fine fabrics or large aircraft engines. 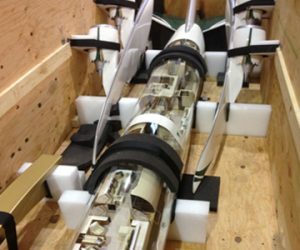 For manufacturers in the defense industry we provide packaging that meets strict MIL Spec packaging standards. Your product can be built with a variety of materials including wood, plastic, metal composite materials and more. By investing in custom industrial packaging for your business, you can maximum profits, efficiency, and success. Call FCA Packaging today and take advantage of our packaging experts experience Call FCA Packaging today for a consultation and packaging analysis! Contact our corporate office at (309) 792-3444 or fill out our contact form.